Yesterday morning very early, while it was still night, we started our car trip Kalisizo (southwest) where we were supposed to do a video and photo shooting. Still in the city I could see hundreds of people walking in the darkness towards their jobs (there are no street lights). Others used some kind of motorized vehicle. After we got out of the Kampala I started writing about the things that called my attention, sometimes taking photos. Since I spent most of my time in Kampala and in our nice house, I’m not always aware of how much my situation is different, and how Kampala is different from the rest of the country. Things seem quite familiar when we walk to the shop to get some food. There are cars and motorbikes, a street, houses, people… But yesterday after over two hours in the car I realized some things. Normally there are no side walks, only red dirt. There is no electricity. Some are lucky and have a generator. Only some people have a car or a motorbike. There is no distribution of water. 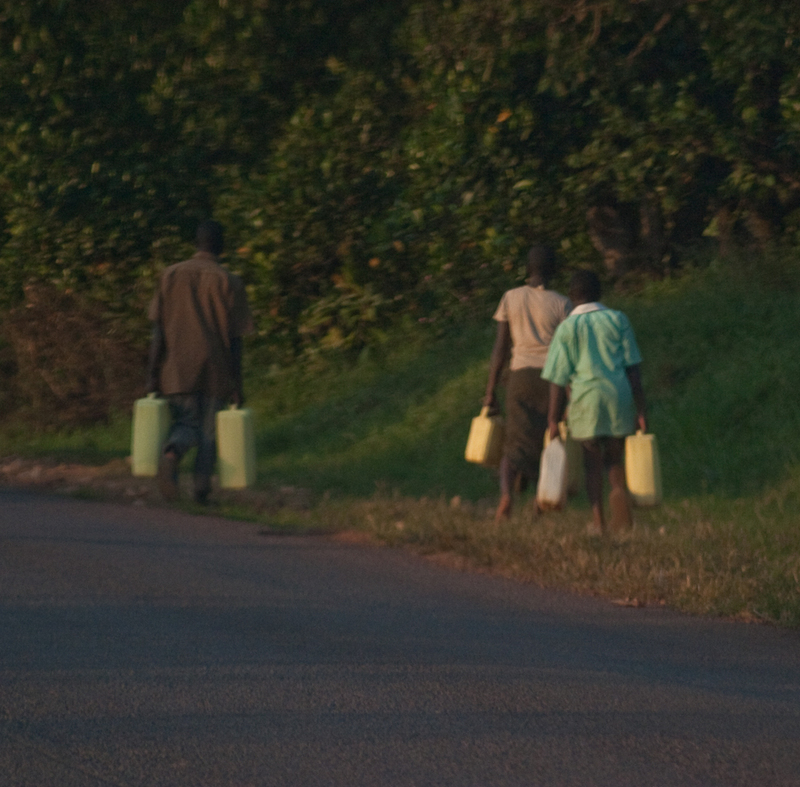 I saw hundreds of adults and children with big bottles, walking or pushing a bicycle, to get some water. There is no postal service. You can have a p.o. box, but mail won’t come to your home. You only have trash pick up if you have money to pay for it. Cell phones are more common. It was strange to see that dozens of towns had houses painted with bright colors. They included cell phone company logos. I guess companies paint the houses as advertising. So every town had one or more yellow houses, one or more pink houses… I saw guys with rifles. It’s a normal thing here. They are the security guards. They wear uniforms, and I see lots of them often walking in or out the headquarters of the company. Sometimes riding a bicycles with their rifles. I haven’t seen yet a single person that looked agressive. A tall pile of car engines on my left, maybe 20 or 30 of them. Lots of car parts. Front parts of trucks, like truck faces. Most cars are asian here. Many are second hand korean cars, with korean texts written on them. Sofas and beds for sale in the street. Containers used as a shop. Kids walking to school in the middle of the road, maybe for kilometers. Bicycles with a pillow in the back side for carrying someone. 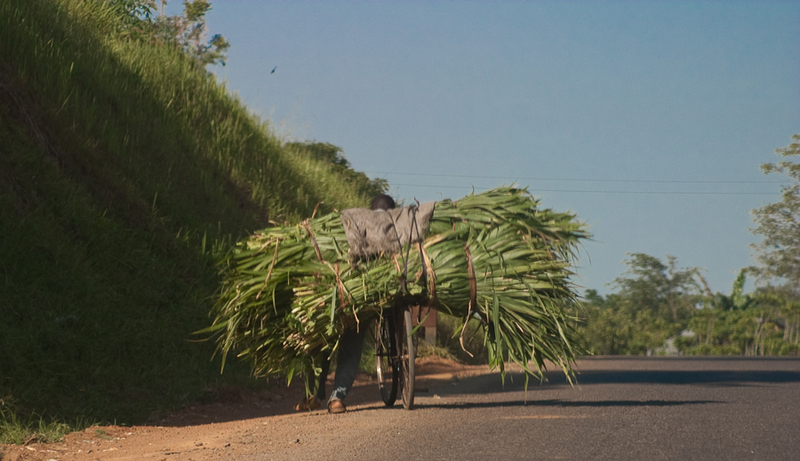 Bicycles carrying 4 water containers, or lots of banans, or banana tree leaves. Women with long colorful dresses. Women sitting on the back of a motorbike, both legs to the left side. Trucks packed with bananas, people on top. Woman sweeping a dirt ground. I think when people go cut their hair here they probably choose between 0.5 mm and 4 mm. Some women have longer hair. Termites create big piles of red dirt, maybe up to 1.5 meters high. They look like little volcanoes, and you see them very often. We crossed the equator. We discovered a nail in one of the wheels, which stayed there for the rest of the trip. At times I had my eyes closed and slept. Then I took some photos again. Roads have huge speed bumps to make you slow down. They are so high that often the bottom of the car hits the bump. The time in the medical / research center was very interesting. I talked to doctors, to a very friendly Sister (nurse). Miquel and I changed our shoes and clothes for the typical doctor clothing, including hats and masks. We were shown how a adult circumcision is done, beginning with washing the hands, putting gloves one, wearing the clothes correctly, the tools and environment, the anesthesia, the operation, and the post operation talk to the patient. I was a bit worried I would faint when seeing blood, but I was so concentrated on my work and interested in the doctor’s explanations that I had no problem at all. I used the Flash pointed to the ceiling and a 20D in manual mode with a stabilized zoom lens. The images resulted very sharp with good lighting. I learned that this operation can reduce 60% the chances of getting HIV, that’s why we create learning material so it can become more widespread. After many hours of work, we got out. There was a small bird sitting in the power cables, and it seemed to be laughing time after time. Every day I see and hear a new bird :) We drove back for a few hours. A great sunset. A big traffic jam at the entrance of Kampala. Next week I will probably go there again. I will try to record some video so you see what I described.